The current church of Sant’Andrea was built in 1748 as a rebuilding of a church of the 15th century. The front has a baroque style. In the inside the baptistery is attributed to Sansovino, while the most significant artwork is a canvas representing the Crucifixion, that was initially attributed to Palma il Vecchio and later to Marescalco (Giovanni Buonconsiglio). There are also other important works, such as a Sant’Andrea made by Antonio Marinetti, named Il Chiozzotto, some works of Giuseppe Cherubini of the 20th century and a wooden gold statue of the 16th century. Near the church there is the bell tower, 30 meters high and of roman and byzantine origins, that was used as a lighthouse or a watchtower. Inside the tower we can find the oldest tower clock of the world, which is still working. 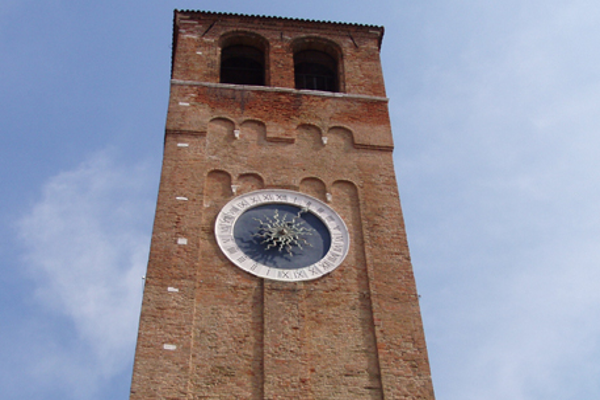 Originally it belonged to the old Podesta palace where it was placed on the northwest tower since 1386, then it was given to the parish of Sant’Andrea and it is in this tower since the 31 May 1839 on the occasion of the demolition and reconstruction of the old city hall. There is no reason to doubt that it was constructed by the Dondi’s, who were in the city at that time and they were famous manufacturers of clocks and sophisticated mechanical equipment such as the “Astrario”, of which it’s possible to see a reproduction in the city museum. The inside of this tower has been turned into a kind of vertical museum, in which it’s possible to get up stairs to discover the story and the functioning of the ancient tower clock and also to enjoy a fine view of the city. It is possible to visit the Church every day, while the clock tower can be visited only on Sunday.